DOE’s Vehicle Technologies Program is responsible for researching and improving energy storage technologies for a wide range of vehicle applications. These include hybrid electric vehicles (HEVs), plug-in hybrid electric vehicles (PHEVs), and battery electric vehicles (EVs). The effort includes multiple activities – hardware development with industry (United Stated Advanced Battery Consortium (USABC)), mid-term R&D (Applied Battery Research (ABR)), and focused fundamental research (Batteries for Advanced Transportation Technologies (BATT)). The three energy storage R&D activities are designed to complement each other. The USABC’s goal is to support the development of a domestic advanced battery industry whose products can meet the technical goals. The ABR program assists industrial developers overcome the key barriers to the use of lithium-ion batteries for transportation applications; mainly safety, life and cost. The BATT program addresses fundamental issues of chemistries and materials associated with lithium batteries. This lecture will describe the research being pursued. TIEN DUONG is currently manager for the Batteries for Advanced Transportation Technologies (BATT) activity at the U.S. Department of Energy. The focus of the BATT activity is conducting research and development on the next generation of battery technologies – beyond lithium ion batteries. He has been a staff member of the Energy Storage R&D of the Vehicle Technologies Program since 1994. He was manager of the Energy Storage R&D Effort from 1999 to 2003, and was team lead of the Hybrid and Electric Systems Team from 2004 to 2008. 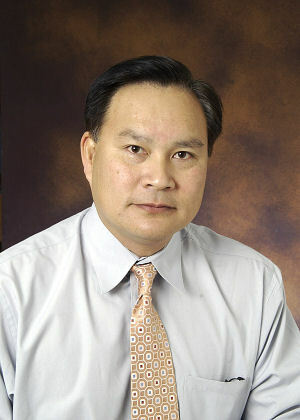 Before joining the Department of Energy, Tien worked as a senior electrical engineer at the U.S. Army Belvoir Research and Development Engineering Center at Fort Belvoir, Virginia. He conducted power assessments, design modifications, and testing of generator sets in support of the Department of Defense Project Manager Mobile Electric Power (PM-MEP). He studied Chemistry at the University of Saigon, Vietnam before emigrating to the United States in 1979. He holds a B.S. degree in Electrical Engineering, and a M.S. degree in Civil Engineering from Virginia Polytechnic Institute and State University. President Robin Taylor called the 2,265th meeting to order at 8:20 pm February 19, 2010 in the Powell Auditorium of the Cosmos Club. Ms. Taylor announced a publication by a member and the death of another member. The minutes of the 2,264th meeting were read and approved. Mr. Duong supervises a group called Batteries for Advanced Transportation Technologies. The charter of the group is to advance the development of batteries and similar devices to enable market penetration of hybrid and electric vehicles. These vehicles are power-assist hybrid electric vehicles (HEVs), plug-in hybrids (PHEVs), and battery electric vehicles (EVs). The group’s goals are a 25 kW power-assist HEV battery that costs $500 by 2010 and a PHEV battery that enables a 40-mile all-electric range and costs $3,400 by 2014. Batteries are the limiting factor in electric and electric-assist vehicles because of their cost and weight. There are three elements to their R&D program. First, they work with industry to develop prototype batteries. Second, they assist developers of lithium-ion technologies to overcome market barriers. Third, in a fundamental effort, they work to develop the next generation of battery technology. Their budget is rising. In a series of steps, it has gone from $22.5 million to $94 million for 2011. The focus has changed, too, from EV batteries in 1992 - 1995, to HEV batteries in 1995 to 2000, to fuel cell vehicles in 2000 to 2008. Since 2008, they have been focusing on PHEVs. He showed a Ragone plot of the types of batteries. Lithium-ion (Li-ion) batteries have the best combination of specific energy and specific power. Nickel-metal hydride (Ni-MH) batteries are the second best and lead acid batteries third. Capacitors are better than any batteries in specific power. Ni-MH batteries also have a remarkable life cycle; they can be discharged and recharged as many as a million times. The Prius automobile has been in use since 1997 and Mr. Duong knows of no battery failures. The different vehicles have quite different battery requirements. HEV’s need 1 - 2 kWh. They operate only between 40% and 70% of fully charged. PHEVs need 5 - 15 kWh; they are fully charged and discharged to about 35%. EVs need at least 40 kWh; they are fully charged and discharged down to about 25%. Standard charge-discharge patterns that simulate the charging and discharging that occurs while driving are used to test the batteries. Unlike gasoline engines, the power available goes down as the battery is discharged. They consider a battery inoperable when the voltage is reduced by 1/3. He described the chemistry of the Li-ion type battery. This is called an integration battery because all the lithium is integrated in the cathode when it is discharged. As it is charged, ions are moved over to the graphite anode. People call it a rocking chair battery, because the ions move back and forth. There are five types of Li-ion batteries being produced: cobalt oxide, nickelate, manganese spinel, iron phosphate, and titanate. He showed graphic descriptions of the ion movement in all of them. Li-ion batteries all have the advantage of high specific energy, theoretically, at least. Each type has particular disadvantages. Nickelate Li-ions have safety problems and poor cycle life. Manganese-spinel ones have low energy, currently, and poor life. Iron-phosphate ones have relatively low energy. The Titanate ones have low voltage and relatively low actual energy. They all have the problem that increasing available energy reduces life and they are expensive, about $1,000 a kWh. Mid-term R&D is focused on advanced anode materials such as silicon and sodium nitrate, but they undergo large volume changes in battery cycles. A lithium rich, layered cathode produces high voltage and high amperage, but an electrolyte has not been found that is stable at the high voltage. Long-term R&D is expected to focus on lithium-metal anodes, which would produce a very high specific energy. Problems associated with them at present are dendrite formation and solvent reduction. They hope to address these with ceramic-polymer stabilization layers. Still farther in the future, they hope to use materials such as lithium-vanadium oxide and vanadium oxide. These materials produce sulfur reactions that discharge the battery or passivate the electrodes. They hope to address these by confining the polysulfides in nano-channels or using solvents or additives. Then, still farther out, is the Li-air battery, with theoretical specific energy of about 11,000 Wh/kg. The reaction is hard to control and produces unwanted chemicals in the battery, though, and the charging requires a very high voltage and poor energy efficiency. In the discussion period, one of the first questions was about lithium availability. Mr. Duong dispelled the idea that lithium supply would be insufficient for battery use. The actual amount of lithium in batteries is very small, and recycling it, which is not now done, would not have a great multiplier effect on supply, long-term. Someone asked about standardization in vehicles that would allow them to use whatever kind of batteries are found to work best. Mr. Duong said they have worked with the Society of Automotive Engineers to encourage that. Mr. Duong was asked what the Chinese are doing, China being on the cusp of an enormous energy demand and also on the cusp of becoming the largest automobile market. They have worked on several chemistry possibilities. Like us, they have not selected one. The same is true for Japan, which is ahead of the rest of the world in electric cars. Another question was about capacitors. They are of great interest because of the tremendous power they can produce, but their specific energy is so low you can’t find a place to put them on a car. Someone asked how Mr. Duong’s problem might change if he assumed a car would weigh 1,500 pounds instead of 3,000. He admitted it would be quite difficult to produce an electric car of that weight. They do have people working on “light weighting” materials, though. Finally, someone asked about how extensive such battery R&D efforts are in other countries. Germany has a comparable effort, comparable in goals and political approach. China has some, but not so much. After the talk, Ms. Taylor presented a plaque commemorating the occasion and welcomed Mr. Duong to membership. She invited guests to apply for membership. She announced an upcoming the CapSci event sponsored by our sister organization, the Washington Academy of Science, where several Society members will speak. She made the usual housekeeping announcements. She announced the next meeting and invited announcements from the floor. Finally, at 9:55 pm, she adjourned the 2,265th meeting to the social hour.